A family owned waste company came to Vorstrom with a wish list for their new, versatile vacuum unit. The unit had to be compact enough to fit in house yards, big enough to fit six household septics and feature a CFM with grit catchers to tackle a large industrial vacuum job. A family owned waste company came to Vorstrom with a wish list for their new, versatile vacuum unit. The unit had to be compact enough to fit in house yards, big enough to fit six household septics and feature a CFM with grit catchers to tackle a large industrial vacuum job. 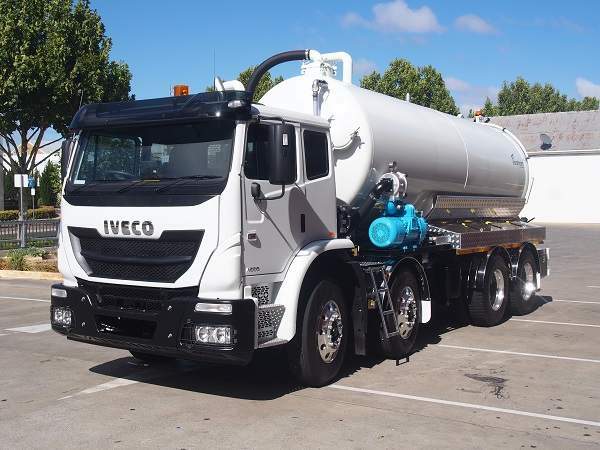 Other specifications included a full opening rear door with 60 degrees tip out angle, hydro digging capacity, 1500L of blasting water, the ability to hold 100M of suction hose at all times and two capacity for a three axle dog for the bulk liquid waste transfer work. The overall requirement was a neat and tidy compact unit that was at home in the standard backyard or on early morning grease trap run through to completing large industrial jobs that were currently being serviced by super suckers from a major centre. The need to balance these requirements and design a vacuum truck that wasn’t too big or too small was a tough task. We started off with the maximum size truck that could fit the tight access requirements and then came up with the short wheel base freightliner 400 HP with an 18 speed road ranger transmission. This truck suited the application as far as the truck was concerned but didn’t leave a huge amount of room for a complex high capacity vacuum unit. A 3D model was developed on our inhouse Solidworks program and then transferred to the axle weight calculating system providing staff with the reassurance that it was going to work. The 1000CFM side mount blower pack fitted perfectly in the spare chassis available on the right hand side of the truck. The truck had a 1000L fuel capacity which wasn’t required so we transferred one tank over to hydraulic oil. This solved the problem of storing 400L of hydraulic oil on a space restricted unit. The front of the unit was carefully planned to incorporate the twin oil coolers, the 1000CFM grit catcher, control panel, front mount hoist and suction breakaway fitting. The design ticked all the boxes, the unit went into production and was delivered six weeks later. 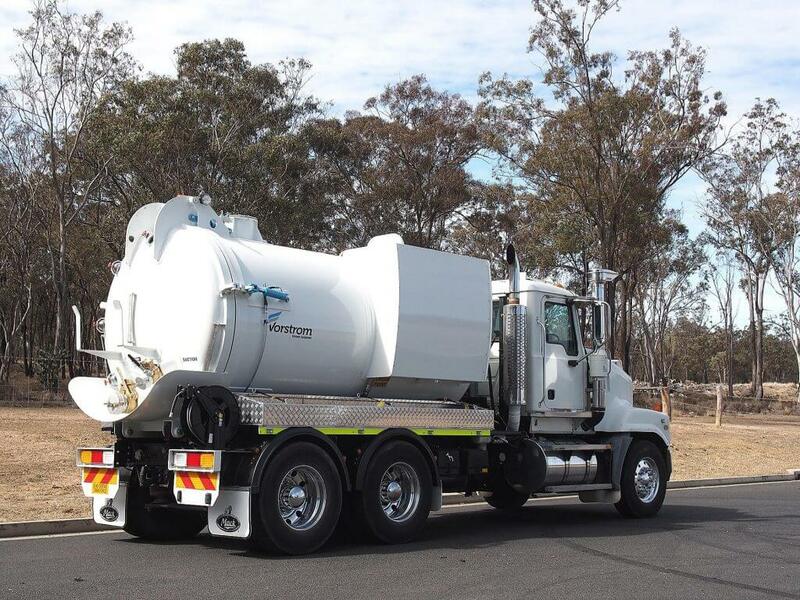 The key to our approach is creating a vacuum truck to do the job, just as you need it. We take the time to discover your needs, understand what you’ll be pumping or excavating, and make sure you’re covered for capacity, safety and access. And we undertake deep consultation with each and every customer during the design stage. Then, we configure one of our proven designs and build it under strict quality control in Australia. We deliver to your door every time and are on call anytime you need servicing and parts. Plus, we don’t shirk the dirty work we’re on call anytime you need servicing and parts. The upshot? You’re in and out of jobs faster, operators have it easier, and you’ve got instant, local backup when you need it. Research fuels our progress. Constant operator feedback guides our product development, to make our units even easier to use, adaptable to different conditions, and fully functional. Get updates from Vorstrom and industry news right in your inbox. Enter your email address below to subscribe.